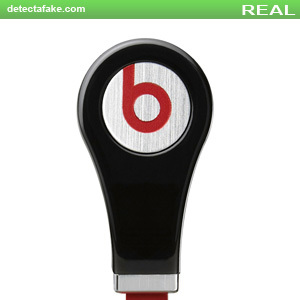 Beats earbuds are one of the most popular counterfeited electrical device sold. 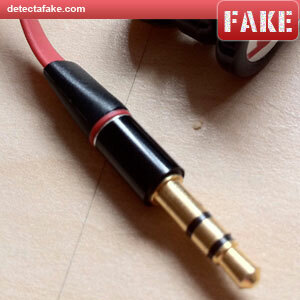 Make sure the earbuds you buy pass all the tests below so you don't become another victim. The first thing to look at is the back of the earbuds. This should be a metallic surface that looks like brushed aluminum going North and South. The "b" should be inset and smooth. As you can see in the real one, the "b" and the brushed metal backing are high quality. 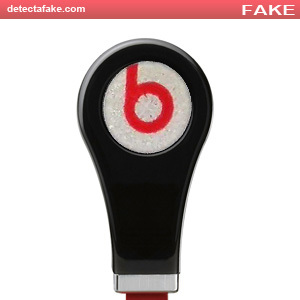 In the fake pic, the "b" and the metal backing are low quality and the "b" is actually bleeding over. 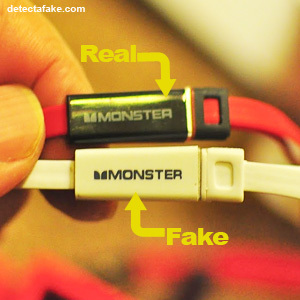 Some of the fakes actually use a sticker, they are easy to see if you are looking for it. You also need to make sure the chrome collar at the bottom looks like chrome and not plastic. Some of the fakes do not. 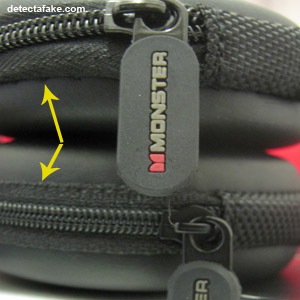 Check the collar of the jack and make sure there is a serial number stamped into it. if there is not, it's a fake. Next, look at the splitter. As you can see on the real ones, there is a chrome collar in the middle that should have no space between it and the pieces on either side. On the fake one, you can clearly see a space between it and the piece to the left. 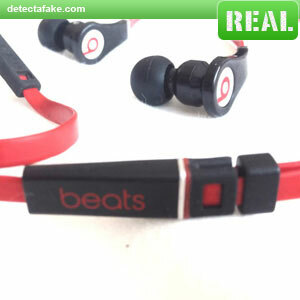 This area is common for poor quality on the counterfeit beats. 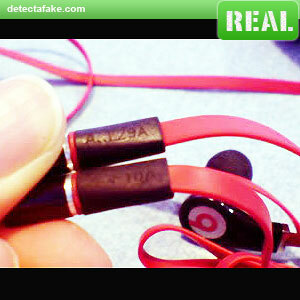 If your earbuds have a case, make sure there is no fraying where the zipper is attached to the case. There should be no quality issues at all along the zipper line.